AIO Boot supports creating multiple versions of Windows in one USB. This article will guide how to create Windows 10 bootable USB from ISO file with UEFI support using this tool. There are many tools that can help you create a Windows 10 installation media, AIO Boot is one of these tools. What are the advantages of this tool? AIO Boot is a multiboot tool. Allows you to create multiple Windows, Linux, Antivirus and many other utilities in just one USB drive. You can create multiple operating systems without having to reformat the drive. You just need to create a bootable USB that contains all the operating systems you want, then you just have to choose to use them. Windows 7, 8, 8.1 và Vista. Windows XP SP2 and SP3 are still supported. Versions of Windows Server respectively. With UEFI and Legacy support. 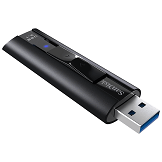 USB 3.0 driver for Windows 7. This helps you to install Windows 7 using USB 3.0. If you use other software, you may get the error “A required CD/DVD drive device driver is missing. If you have a driver floppy disk, CD, DVD, or USB flash drive, please insert it now.“. You do not need to modify or download the modified ISO and integrate USB 3.0 by anyone else. Supports SATA/RAID/SCSI drivers for Windows XP. It helps you avoid blue screen when installing Windows XP on modern computers. Supports Windows ISO files larger than 4GB. It will not matter if you are using an NTFS partition, except you can not boot UEFI from an NTFS partition. But if the drive is formatted in FAT32, the install.wim (or install.esd) file will not be able to extract if its size is larger than 4GB. AIO Boot will split the ISO file into several parts so that it can be stored on FAT32 and of course it supports UEFI. Microsoft and many other software are no longer supported for this old operating system version. AIO Boot still supports, even runs well on this system. This makes it easy to create Windows bootable USB to upgrade to newer versions. Above are just a few features of AIO Boot, see more full of features. First, you need to download and install AIO Boot to the drive. This tool will extract the required files to the drive and install the boot loader. You only need to install it once and then use that to integrate multiple OS into the drive where you installed it. Download the Windows ISO file to your computer. 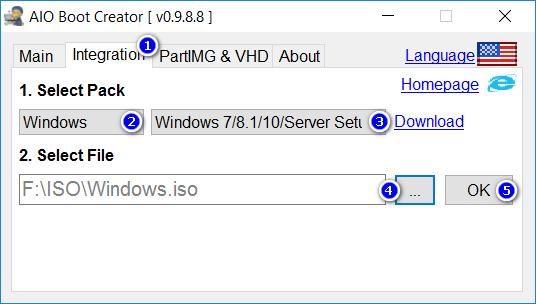 AIO Boot also supports ISO downloads from the Windows 10 media creation tool, which can include both 64-bit and 32-bit versions. Run AIOCreator.exe, switch to Integration, select Windows and then select Windows 7/8.1/10/Server Setup from the drop down list. Click the “…” button to select the ISO file on your computer. Click the OK button to start integrating. After the process is complete, you can continue to select another ISO file to integrate, the previous package will not be affected. You can remove older versions to save disk space and then integrate newer versions. Switch to Main, open the Menu Editor, select the packages you want to remove, and then click Save. Once you have integrated the ISO you want, reboot the machine for testing. You will see a list of packages in the WinPE & Setup menu. Also, you can install Windows 10 using ISO from WinPE, but this method does not support the Repair your computer option. Good luck! The installation cannot proceed. I have separately used Rufus to make a bootable Windows 10 installer from the same ISO and I have no issues. Could you please possibly tell me why this is the case?